For those of you who enjoyed reading the story of Dr. Katherine (Livingstone) Bick who was born in Clyde River and attended school in the community, you will have the opportunity to meet her this summer. 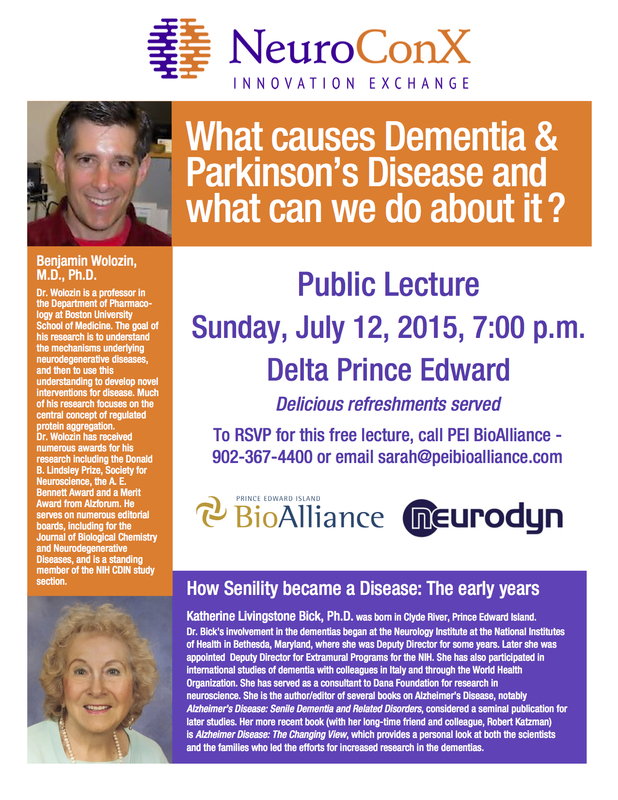 She will be the special guest of PEI BioAlliance at the NeuroConX conference public lecture on Sunday evening, July 12th at 7:00 at the Delta Prince Edward, 18 Queen Street, Charlottetown. Katherine will open the evening talking about “When Senility became a Disease: The early years.” She co-authored the first book written on Alzheimer’s Disease. The evening will also feature Dr. Benjamin Wolozin, from the Boston University School of Medicine who will present “What causes Dementia & Parkinson’s Disease and what can we do about it?”. Katherine will be pleased to know that some folks from Clyde River will be in the audience. To register for this free event, you can click here. You can also call 902-367-4400 or email sarah@peibioalliance.com. Refreshments will be served. Below is the poster for the event. To read Katherine’s story, click here.